A framework, or moyo, is an area where one player has a large influence, and which potentially could become that player's territory. In the diagram we see a large black framework on the bottom left side, and a white framework on the top and right side. A framework is often explained as potential territory or referred to as a territorial framework, but one should be careful about considering it as such. Turning a framework directly into territory (consolidation) is often not the best way to deal with it, especially not with large, spread-out moyos like this one. Rather, a framework player should invite the opponent to invade, and then get profit from the resulting attack on a weak group. It therefore makes sense to think of frameworks as 50% territory, in which possible invasions remain. Perhaps the opponent will invade and only half becomes secure territory (net of the territory the opponent takes); perhaps the framework instead becomes an influential position earning value in some other direction. If you have two frameworks your opponent may only have time to invade one of them deeply. In any case frameworks are a feature of the middle game in most well-played games. Of course if your opponent refuses to invade you should gradually convert your framework into territory. This is often not the way things should work out. Best play and strategy for both sides in a game with a large framework may be for the framework player to expand it until the framework threatens to become overwhelming, forcing an invasion from the opponent. Then a measure of consolidation of the framework will take place. One can think of three things that result when Black invades at a: (1) White will kill the invading stones. (2) White will trap the invaders, but they will live. (3) White will force the invaders to flee. (1) If you kill stones played inside your territory, you make gain (assuming the same number of plays by each player). Since the framework was not yet your territory, you have made a gain by killing, unless your opponent has gotten sufficient compensation for the sacrifice. (2) If you enclose the invaders, who live, your wall may be worth more than the territory the opponent makes with the invasion. It may nail down territory for you, it may support your own invasion, it may aid an attack. (3) If you chase the invaders out, the attack may enable you to make territory elsewhere, capture other stones, or ruin the opponent's moyo. There are also small-scale frameworks, which don't yet aspire to huge ambitions. 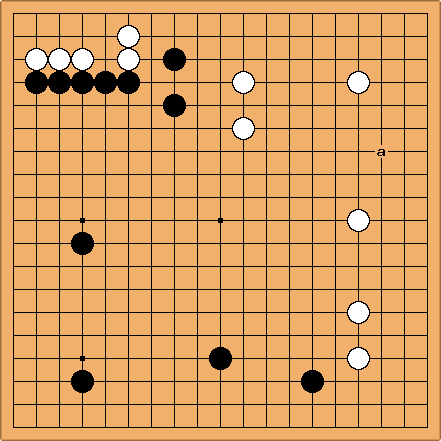 With this extension of Black 1, the proper development of the 4-4 point top left can be seen. Naturally Black has no definite territory here yet. But if White invades at 3-3 Black will block as shown and build a substantial wall, working harmoniously with the extension stone. A corner enclosure (shimari) with a typical extension along the side is further extended with a one-point-jump (Ikken Tobi) turning into a (sort of box-shaped) framework. This sort of gameplay is also called '3-dimensional' position sometimes. After his extension of Black 1, the proper development of his position into a framework happens with the one-point-jump of Black 3. For some general discussion, see framework theory. See also consolidating frameworks. A game with no frameworks at all, just secure territories and weak groups, can be called a game of small groups. Such games tend to be more about exact reading than strategy.